Gator Cases GBE series guitar gig bags are the right choice for those looking for light and inexpensive but reliable protection for their instruments. The GBE series gig bags feature 10mm padding to protect against dings and scratches. 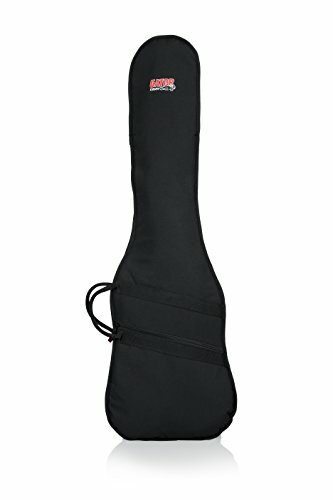 The Gator Cases GBE-series gig bags include a reinforced interior around the head stock of the guitar neck to provide extra protection for the most fragile part of the instrument. The GBE series by Gator Cases also features a generously large outer pocket for storage of tuners, sheet music, strings and other accessories. The GBE-BASS economy bass guitar gig-bag dimensions are Body Length: 21" Body Height: 3.5" Lower Bout Width: 15" Middle Bout Width: 13" Upper Bout Width: 12" Overall Length: 47"
The GBE series gig bags are available for dreadnought acoustic guitars, electric guitars, bass guitars, classical guitars, acoustic bass guitars, as well as mini acoustic and mini electric guitars. Ukulele sizes are also available in the GBE series of lightweight, inexpensive gig bags by Gator Cases. Gator Cases is known for manufacturing innovative products designed to protect! We offer a wide range of available sizes, materials, and protection levels, for all types of instruments and gear including Frameworks stands, Rackworks install racks and accessories, and Protechtor drum cases. It isn’t hard to find a great reason why Gator should be the brand you trust to protect your equipment for life. Exterior pocket for accessories and adjustable backpack straps. Interior Dims: Body Length: 21" Body Height: 3.5" Lower Bout Width: 15" Middle Bout Width: 13" Upper Bout Width: 12" Overall Length 47"